YouTubers like Kelsey Ellison spend time crafting video content in the hope it will be seen by millions of people. But for Kelsey, it was a 15 second Twitter video filmed by a friend that brought her worldwide attention. The 25-year-old has been sharing videos with her YouTube followers under her own name for seven years, but now she’s better known as ‘Dancing Hermione’. Dressed as the Harry Potter character, Kelsey was filmed dancing at Comic Con in London. The video was first shared on Twitter by Kelsey’s friend, and fellow YouTuber, Connie Glynn on 27th May. Connie’s video of Kelsey has been watched 8 million times, and turned the YouTuber into a viral superstar. “It wasn’t planned at all,” Kelsey tells Newsbeat. Kelsey has been dancing since she was five years old (her early YouTube videos were of her performing to J-pop songs) and taught herself the moves in Connie’s Twitter video. “The style I was doing there, I just taught myself from YouTube videos,” she says. Voguing emerged from Harlem drag queens in the 1960s and was inspired by a mix of ancient Egyptian hieroglyphics and classic poses by models in fashion magazines. 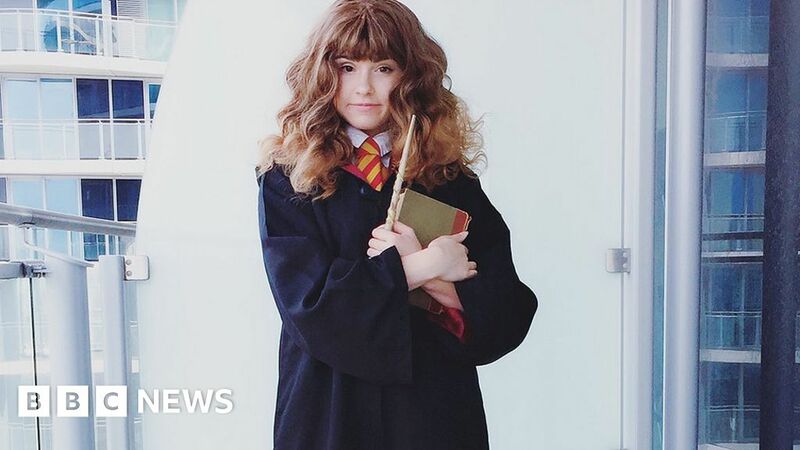 Earlier this week, Kelsey shared a second video of Dancing Hermione – which has been viewed more than 1.1 million times – due to demand from viewers to see more of her moves. “A lot of people were saying: ‘Where’s the death drop?’ which is one of the big dance moves in Vogue Femme, so I just gave them what they wanted,” laughs Kelsey. Kelsey’s love of dance is matched only by her love of Harry Potter – “I’m a really big fan, stupidly big” – and says Hermione has been a huge inspiration to her. “I just love that she always stays true to herself, she doesn’t care what other people think about her being smart, her opinions or anything,” Kelsey adds. Kelsey says that her second Hermione video is her “final” appearance as a dancing wizard, but she has one last ambition for her sudden viral fame. She wants Emma Watson (who played the character in the Harry Potter movies) to see the clip.